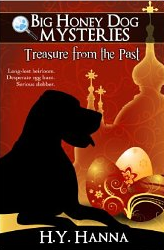 This is a special Easter mystery adventure tale in the Big Honey Dog Mystery series. In this chapter book geared for nine to twelve year olds, the beautiful Great Dane and canine friends assist their human owners in solving a mystery from the past. At the outset, the reader meets Big Honey and some of her canine friends who are playing outdoors while their masters celebrate a beautiful Easter day. The talk turns to the top of the slope where they spy mysterious onion shaped domes in which rumor says a creepy witch lives. Suka, the Siberian Husky, swears she wears black and has creepy claws. Of course they decide to investigate and are startled to find an ominous black figure before them. Turns out to be a old woman guarded by her huge black dog. Our canine friends call out to their owners who come to the rescue. But the true mystery is about to materialize. The poor old woman named Irina is starving and in danger of losing her house. Years ago she escaped the Russian Revolution with her mother and Nanny. Hidden among their few belongings were a valuable Faberge jeweled egg and a red ruby. After Irina’s parents died, she was forced to sell most of her belongings to pay off their debts. Hidden in a letter that her grandmother wrote are the clues to solving the mystery of where these valuables are hidden. Together with Mishka, Irina’s faithful dog, the indomitable canines head up to the attic to search for clues. They are attacked by a barn owl, but nothing deters them from their mission. Will the fearless canine friends be able to save the day for Irina and Mishka? The novella is well written combining mystery, history and humor. It is fun to real a tale told from the canine viewpoint. The animals walk their humans outside and cleverly gain the upper hand. Highly recommended for children age nine and up. Adults will find the short story appealing and amusing as well. Today, I would like to share a book review blog on “Canines To The Rescue: written by H.Y. Hanna. This is a novella for ages 9-12 but adults will also enjoy the book. Prices are very reasonable, from Amazon.com, and it is available for Kindle. Please enjoy the review from barbara ann mojica’s blog. So glad that you enjoyed reading it!